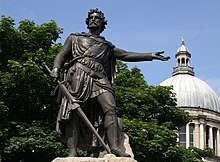 Statue of William Wallace in Aberdeen. Wallace was one of the main Scottish leaders during the Wars of Scottish Independence. Scottish nationalism promotes the idea that the Scottish people form a cohesive nation and national identity and is closely linked to the cause of Scottish home rule and Scottish independence, the ideology of the Scottish National Party, the party forming the Scottish Government. Scottish nationalism is characterised as civic nationalism rather than ethnic nationalism  in that the Scottish people are defined as those living in the country, regardless of race or culture. The Acts of Union merged the independent kingdoms of Scotland and England into Great Britain in 1707, but a separate legal system and distinct Scottish institutions continued to exist. Linguistic independence was an important part of the twentieth-century Scottish Renaissance, associated with the nationalist impetus provided by Hugh MacDiarmid. ^ Harvie, Christopher (2004). Scotland and nationalism: Scottish society and politics, 1707 to the present. ISBN 9780415327251. ^ Weber, Victoria. "Scottish, English, British, European Identities: A Literature Review" (PDF). Retrieved 23 May 2013.